We’ve been busy working with Avid to implement their new Cloud interface version 2. 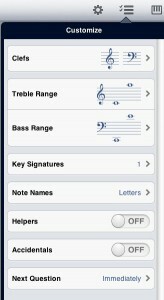 This brings a fresher interface to our scores and the ability to play and print from your iPhone or iPad. The controls have moved to the bottom of the screen which helps mobile users but we’ve asked for that to be configurable together with a few other tweaks. Our database has now grown to 120,000 arrangements and we have been busy separating songs with the same titles into different songs, adding album titles where useful and albums as collections of songs. 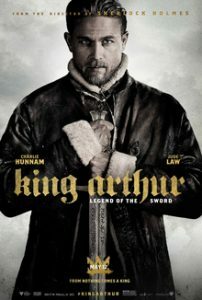 In a few weeks, the latest film about King Arthur will be released and it promises to be a huge success. This version is written by Joby Harold and directed by Guy Ritchie. At Great Scores we love good films but we love their soundtracks more. There is little information available at the moment save that the music will be by Daniel Pemberton and released by WaterTower Music. You may not be familiar with Daniel Pemberton. He is an Ivor Novello winning and multi-BAFTA nominated composer and has score many Emmy and BAFTA award winning dramas and documentaries such as Complicit, Peep Show, Upstairs Downstairs, Desperate Romantics, Space Dive, Occupation and Hiroshima. He works with a wide range of musical mediums – from electronic to orchestral. He moved into film with the supernatural thriller The Awakening (2011). More recently he worked with Guy Ritchie on The Man From U.N.C.L.E. (2015). The title track audio has been released and can be heard here. It’s quite an earthy sound and we can expect a fair amount of that throughout the film. We will update our site as soon as we can source the sheet music. We’ve been pretty quiet whilst working on some sizeable projects. Sorry about that but we’re back with an important update – 90% of our scores can now be previewed, transposed and played using your browser. No more plug-ins! The Scorch plug-in was fantastic for many years, for which we are grateful, but as support was slowly dropped by browsers, for a lot of plug-in types, we had to find something different. So we have introduced the AVID sheet music player. You need to have a reasonably uptodate browser – Chrome v39+, Firefox v34+, Internet Explorer v10+ and they should all work on the Mac and Safari 8+ (requires OSX Yosemite) also works. This also, of course, means you can view your entire scores once purchased and print them off. Note that this does not yet work from most mobile devices. Also this applies to new purchases only at this time. 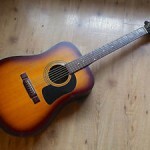 Which is the best instrument to learn first: Acoustic Guitar, Electric Guitar or Bass Guitar? I Am often asked which instrument is easiest to learn. There isn’t really a straight answer for that, as it always depends how far you want to take your playing. Bass guitar is fairly easy to get going on, but some people cannot develop enough strength in their hands to press down the rather fat strings. On top of that if, you want to play like jazz legend Jaco Pastorius, then playing bass guitar is very difficult. By contract playing the double bass is very hard right from the start, as there are no frets (so you have no gauge of where to place your fingers, and for a long time you will play out of tune), and the strings are even longer and harder to press down. Amongst the woodwind family, the alto and tenor saxophones are the easiest. Though soprano and sopranino saxophones are quite tricky. A common question is which out of acoustic guitar, electric guitar or bass guitar students should choose. Well the choice between bass guitar or guitar is basically down to what you want to play. If you feel like laying down low grooves, playing very repetitive lines and being the foundation of the piece, then bass guitar is for you. Always try one out first, to see if your hands are big and strong enough to fret the notes. Your fingers will hurt for quite a few months when you first start practicing, but this does ease after a while as you build up pads/callouses under the skin of your fingers. One of the fun things about playing bass guitar is that you can play along with your favourite pop/rock recordings quite quickly, and it can be rather good fun. As a random example, the bass parts for any U2 songs are really easy to learn. One thing you have to consider if you buy a bass is that you will also need an amplifier if you want any kind of volume. It is perfectly possible to practice on your own however without plugging into an amp. If however, you would rather play guitar riffs, or strum chords andsing along, then bass guitar is not for you. So it is then a question of whether to get an electric guitar, a steel string acoustic or nylon string acoustic. If your thing is rock or metal, then electric is the obvious choice, if you are more indie, then either, but for folk and ballads you’d want an acoustic. With an acoustic you are also free and easy, as you don’t need an amp to carry around. You can learn several easy open chord shapes on the guitar quite quickly and then strum along to quite a number of tunes. To learn all major and minor chords on the guitars is, however, not so easy as some chord shapes are quite painful to execute. Having said that, even some of the best know pop/rock guitarists don’t know all chord shapes (jazz, flamenco and classical players would, however), and that hasn’t stopped them from making great music. BB King, the legenrday Blues guitarist, famously asked the band members of U2 if anyone can play chords, as “I’m no good with chords”. You can of course use and electric guitar, plug it into and amp, add no distortion (so have a clean sound) and strum chords and sing along – but it does not have the same sound as an acoustic. So if you go for an acoustic guitar it’s a question of whether you want a nylon string or a steel string. Steel string guitars have that country sound to them, and can also (if they have an output) be plugged into an amp. Nylon strings have a softer, more flamenco/classcial guitar like sound. Out of the two nylon string guitars are easier to play, as the strings are less abrasive, and chord shapes easier to hold. If however, you want to play rock guitar or metal riffs, then you will need to get an electric. Out of the 3 guitar types, electric is by far the most forgiving guitar to play, as the strings can be thinner, and there is less problem with not fretting notes 100% correctly and therefore getting irritating buzzing. So if you want the easiest guitar to ply, choose an electric, which in theory also gives you the most options. 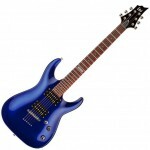 Once you have decided on your guitar type, there is then the small issue of which model to buy. Let the fun begin! I often get asked by my piano students how often they should have their piano tuned. There is a very easy answer to that: twice a year, ideally when the seasons change (from warm to cold and vice versa). The reason being that when winter comes, the central heating comes on. This means that your house will usually have a much drier air to it, which will affect the piano. At the end of winter, once the heating comes off, the windows are opened, the central heating is switched off, sunlight might hit the piano and slightly moister air might surround the piano – and the wood will absorb this moisture. Pianos are mostly made of wood, metal and felt, and the wood in particular will absorb and release moisture with changes in humidity and temperature. This will affect the tuning of the piano, and these changes mostly occur as the seasons change. So as a rule of thumb, October/November and then again around May are usually good times to call your tuner. He will normally offer to call you every 6 months to arrange an appointment anyway. 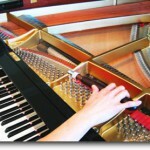 If you don’t have your piano tuned at these intervals the tuning of the piano will start dropping. This can create real problems if it is left too long, as the tuner can then not immediately tune it up to what is called concert pitch, as the added extra tension would make the piano frame crack. Unlike a guitar or violin or double bass, there is a huge amount of pressure on piano strings, something like 20 tons on the whole (iron) frame. This means that tuning up all strings would increase the overall pressure on the frame by too much, and the frame would break. Violins, guitars, bass guitars, etc are not made of metal, so cannot have such high string tension, and you can easily detune a guitar and tune it back up again without any worries, but this cannot be done with a piano. I have also seen it happen that a piano has been left untuned for too many years, and the tuner simply cannot get it back up to concert pitch, as it has been left too long. Unlike with the aforementioned violins or guitars, you cannot tune a piano yourself. 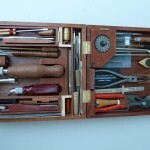 You need specialist wrenches and other equipment (and piano strings aren’t freely available in shops), but more importantly it is quite a skilled and difficult job to tune a piano, and this takes several years of training. If you play your piano a lot, and hit the keys hard, you may need to have the piano tuned more often, and if you are recording it, you will need to have the piano tuned just before the recording. In recording studios and concert halls pianos are tuned before every performance/recording, and I have seen it happen that during a jazz festival the tuner came on stage between acts to tweak the piano a little. Not a lot of fun to listen to. There are many musical themes that we are familiar with these days outside of their original context, as they have been used in tv commercials or films, in a striking and memorable way. For example, a famous melody from a classical piece of music is known to most people in Great Britain as The Hovis Theme. Of course Mr Hovis didn’t write it, and in fact it was written well before the actual composer would have had the chance to enjoy a slice of the aforementioned bread whilst composing his piece. And as the composer was Czech, and wrote the piece in America, the connection to England is getting really tenuous. Never mind the fact that no-one else in the world would know what you were on about if you referred to “The Hovis Theme” to, say, a Canadian, or even tried to engage a Parisian in conversation by referring to “le thème de hovis”. Other themes however have a more global recognition, for example the piece that is used at the start of Stanley Kubrick’s “2001: A Space Odyssey”. In fact that piece is the opening section of the rather cumbersomely titled: “Also Sprach Zarathustra”, German for “And so spoke Zarathustra”, Zarathustra being the Persian prophet and founder of Zoroastrianism. No wonder people remember it as “the piece from 2001”. It was written by Richard Strauss, not to be confused with Johann Strauss II, who wrote “The Blue Danube”, which is also featured in “2001” but much later in the film, in the bit where the spacecraft docks with the space station dock, and the twoseem to be performing some beautiful celestial waltz with each other (The Blue Danube is, rather fittingly, a waltz). The Stella Artois Theme – was actually written for the movie Jean De Florette by Jean-Claude Petit. The piece of music they blast ouf of the helicopters in Apocalypse Now – is actually “The Ride Of The Valkyries” from Richard Wagner’s famous Ring Cycle. The British Airways Theme is actually a piece entitled The Flower Duet from the opera Lakmé by Léo Delibes. The aforementioned piece that accompanies a spaceship docking with a sapcesation in the film 2001 is The Blue Danube Waltz by Johann Strauss II. The Opening theme From 2001 is actually the opening theme from Also Sprach Zarathustra by Richard Strauss (no relation to Johann). The Theme at the end of Ocean’s 11 is actually Clair de Lune by Claude Debussy. And finally The Hovis Theme is acually the Largo movement from The New World Symphony (Symphony No. 9 in E minor) by Antonín Dvořák. 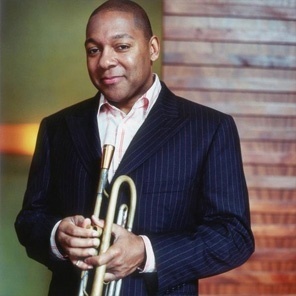 The famous London jazz club Ronnie Scott’s has announced that it will be streaming Wynton Marsalis’ gig on Tuesday the 23rd of July (from 10.30 pm) live from its website – for free! In recent times there has been a fair bit of innovation with regards to how live performances can be experienced by audiences. No longer is it necessary to buy tickets for some events, but live concerts, theatre shows and even opera performances have been broadcast live into cinemas. This obviously opens up new revenue streams for venues, who are hard pressed in these economic times, as often needed financial support from the state has dwindled. The state owned National Theatre of England started the trend in 2009 when it broadcast a production of Phèdre starring Hellen Mirren to 50 cinemas across the UK, with audiences having to pay £10 entry. The experiment was so successful it has continued to this day, under the banner of NT Live. The Royal Opera house runs a similar scheme, with its Live Cinema Season. A number of Pop/Rock bands have also jumped onto the bandwagon, and even the Victoria and Albert’s David Bowie exhibition was broadcast into cinemras, with viewers being taken through the exhibition by curators and special guests. 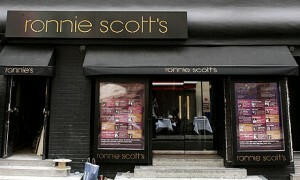 Ronnies Scott’s has now followed suit, though their stream of famous New Orleans trumpeter Wynton Maralis is actually free. As tickets for his gigs at Ronnies’ have alrready sold out, it will also be the only way you’ll be able to watch the gigs. More details can be found on Ronnie’s website. Learning to read music can be quite a struggle for beginners, but on this site there are note reading exercises which you can tailor to your own needs. So if you are an aboslute beginner, and only want to practice natural notes in treble clef, from middle C to the G above, then you can set the site to just test you on those notes. If you fancy testing yourself on bass and treble in all keys, or even the more obscure tenor clef, then you can do that, too. All the way a score is kept, and you get the percentage of correct answers displayed. As someone who teaches, I find this works particularly well for teenage boys, as rather than having to look at tufty old scores, they get to go online, or better still, download an app, and can click on buttons and see a score at the end of it – much more fun! There are quite a number of other exercises you can test your skills on, from key signature, interval and fretboard identification to ear training exercises. 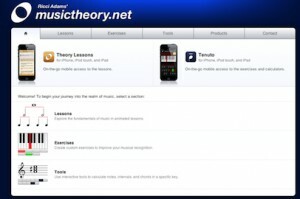 There are also lessons on the basics of music, which are pretty handy (clefs, notes, scales, etc. ), to some slightly more obscure tools, such as for building 12-tone rows. You never know, someone might be writing a 12-tone opus on the train next to you. Most of the time when someone is pushing a site on a blog, it is because of a (monetary) kick-back, but I can assure you that in this case, we have no relationship with this site, we just found it damn useful! This is actually not a string library, but an orchestral ensemble patch library. I mention this however as the string patches are sonically quite incredible. You basically have a choice of Violins in octaves, Violins with Violas, Celli and Bases in octaves or unison, and spiccato patches for Violins and Celli as well as full strings ensemble patches. If you intend to buy any of these either sign up to the companies newsletter, or twitter feed, or like them on facebook, as you will get news of their offers, and these libraries always go on sale at some point (at the time of writing East West have knocked $100 off Hollywood Strings Gold, for example), and truly huge savings can be had. Try to never buy a library at full price. String libraries sound best when you blend two or more, so ideally you should buy more than one. Both the “lite” versions of Hollywood Strings (called Gold) and LA Scoring Strings (called Lite) offer a great starting point at $499 and $399 respectively. If you have not got a fast system, and the choice is between these two, go or LA Scoring Strings (LASS), as this will put a lot less strain in your computer. Listen to the demo tracks available on the website, but be aware that these can sometimes fool you a little, as they are really designed to sound as good as possible, using mostly lush legato articulation or short spiccato patches. But often articulations in-between these two are hard to get right, and 8dio’s Adagio package does especially well at catering for these. Spitfire Albion offers a great alternative, as you also get all the other orchestral ensemble patches for brass, woodwinds and some percussion, as well as some synths, and the sound is outstanding. Over at comedy site College Humour they have created a really funny and clever parody of Leonard Bernstein’s West Side Story. Rather than talking about the rivalry of two gangs in New York City (as the original West Side Story does), the parody uses excerpts from the same songs as West Side Story, but instead weaves the action around how our everyday lives evolve around the internet. But it’s seven characters too long. And I pity, any girl who isn’t me today.